The Grünwalder Forstwirt is set in an idyllic location on a 30,000m² ground in Straßlach 16km from the centre of Munich. 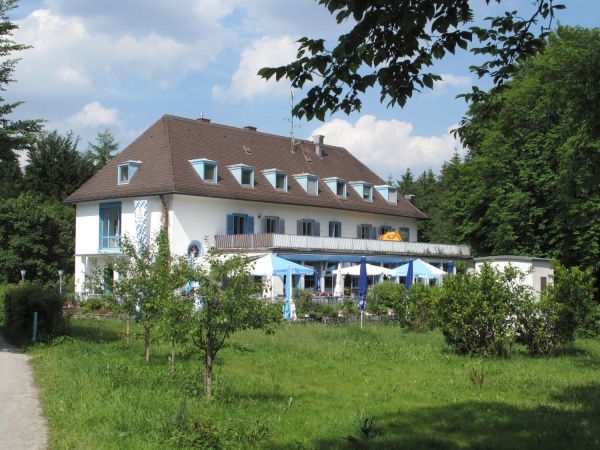 The property is surrounded by the Grünwalder Forest on one side and wide open fields on the other. There are no immediate neighbours. The 83 years old building and property is owned by the Munich tram service as symbolised by an old tram standing on a short rail next to the building. However, there was never a tram line leading to this location. Up until 1994 the property served as a holiday home for Munich's tram drivers. The beer garden and restaurant thereafter opened to the public by the name of Entenalm. With a leaseholder change in 2007 the name changed to Grünwalder Forstwirt. The restaurant is open Wednesday to Sunday from 11.30am and combines Bavarian, Austrian and Italian cuisine. Whenever possible, organic ingredients are used, most of which come from the surrounding farmland of the region. Nearby attractions include a bowling alley, minigolf court and a wild boar enclosure. On clear days the alps are visible in the distance. The beer garden offers 700 seats in the self-serviced area plus 100 on the sunny serviced terrace. In addition to the inside restaurant there is a separate building for up to 150 guests which is an ideal venue for hosting special occasions. The beer sold is Tegernsee Hell at €6.50 p/Maß (June 2014). The food stall in the self-serviced area is open from 11.30am on Saturday, Sunday and on public holidays. On other days guests can collect their drinks and food in the serviced area.